Many small businesses in Cedar Rapids are struggling to recover from flooding in June. Shannon Meyer says helping those businesses will be one of her top priorities when she takes over as the President and CEO of the Cedar Rapids Chamber of Commerce in December. The 33-year-old Wisconsin native was recently selected for the job out of more than 100 applicants. Meyer says she was inspired by the way residents of Cedar Rapids responded to the disaster. "One of the most intriguing things for me (in taking the job) is I know it will be fabulous to be able to look back in five years and to have that wonderful opportunity to have worked with all of these dedicated people in rebuilding Cedar Rapids," Meyer said. The Cedar Rapids Chamber of Commerce has just over 1,600 members. Meyer says she’ll work to build membership, improve the overall business community and increase the public’s awareness of what the chamber is doing. Meyer says she impressed with the "community spirit" in Cedar Rapids when she first became interested in the position. "When I actually got there and got to experience it first hand in talking with a lot of the community leaders, I was sold then that was exactly where I wanted to be," Meyer said. "It’s just amazing to me the amount of dedication and heart that the people of Cedar Rapids have." 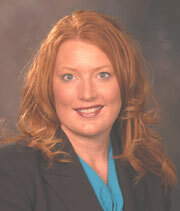 Meyer has spent the last three years as president of the Melbourne-Palm Bay Chamber of Commerce in Florida. She will replace Lee Clancey, who retired in late September. Bob Buntz is serving as the interim CEO of the Cedar Rapids Chamber of Commerce until Meyer arrives on December 1st.